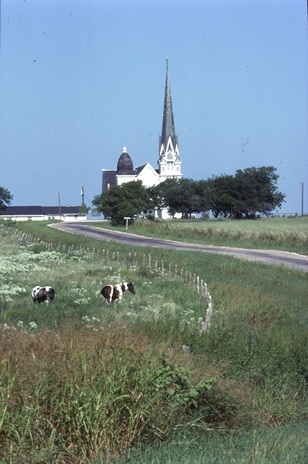 New Sweden dates from 1876 when the community of Knight's Ranch took its name from the New Sweden Evangelical Lutheran Church. New Sweden has a dignified ring to it and we should all be glad they didn't choose "Little Sweden" like they have with "Little Mexico," "Little Havana," and "Little Saigon." 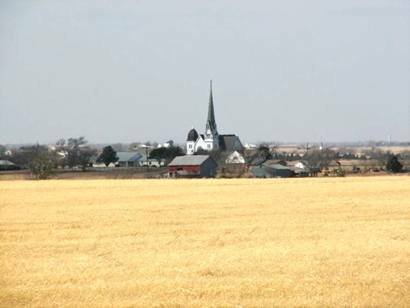 New Sweden's population never went higher than 104 souls according to the Handbook of Texas. It lost its post office in 1902 when they started receiving their mail through Manor. Even the sign in front of the church lists the church's address as Manor. Later, school consolidation helped hasten New Sweden's demise as a distinct community. 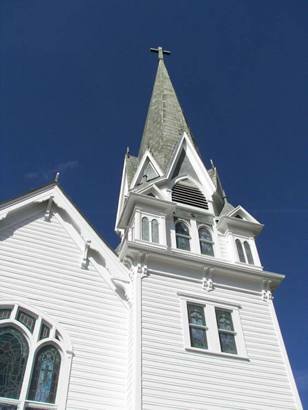 The Church is quite striking with its unusually steep steeple, and it is certainly worth the short drive north from Manor, or even the drive south from Taylor. Nearby - about two miles East, you'll find the Kimbro Cemetery - all that's now left of that Swedish community. The rolling terrain allows one to see for miles in any direction and the cattle and tilled fields make it easy to imagine what life was like here. Don't let the openness fool you. Without a good county map, you can still get lost. From Austin: Take highway 290 East for until you come to FM-973. Turn left (watching traffic) and drive 4 and 8/10ths to New Sweden Church Road. Here you’ll see the cemetery and a historical marker. (This was the site of the first church.) Turn right and follow the road for the remaining 2 miles. Just keep the steeple in sight. At 104 feet tall, it’s easy to do. From Elgin: Take highway 290 W and turn right onto FM1100. After 5 miles, turn left onto Manda Road and drive for about a mile until you see Manda Carlson Road. Turn right and drive 6 /10ths of a mile to New Sweden Church Road and drive the remaining mile and one tenth. Don’t forget to take a photo. "... Swedish immigration to Texas had begun in 1848 and gathered momentum following the Civil War. As word of Texas and its agricultural opportunities spread in Sweden, the pace picked up in the 1870s. 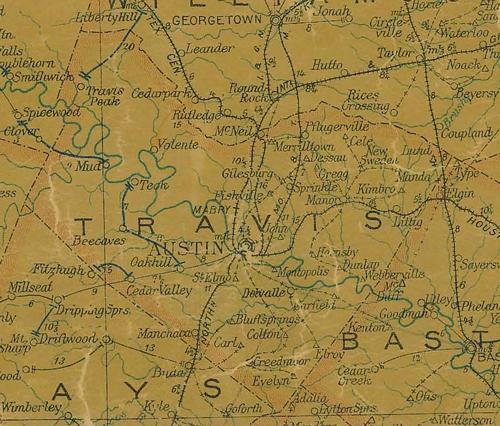 By the time of the first world war, some 11,000 Swedes made their home in the Lone Star State, many of them in Williamson County and northeastern Travis County. ... As my name suggests I have some German background. My dad came to the US with his family in 1956 from Hamburg, Germany. The first town in America they lived in was New Sweden. They attended the New Sweden Lutheran Church, which we visited again a few years ago. This is where my dad and his family got used to living in America. My grandparents are buried at the Kimbro Cemetery, my grandmother died in 1965 and my grandfather in 1983.